I'm all for these snazzy limited edition Oreos, but this one seems like overkill. 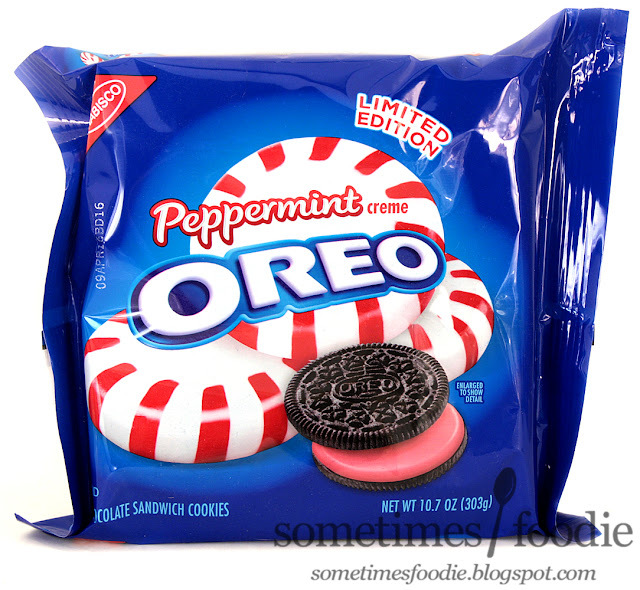 I mean, there's the normal green-filled mint flavored Oreos available year-round, a thin version of the same flavor, these limited edition Candy Cane themed ones I reviewed a few years back, and now a Peppermint? 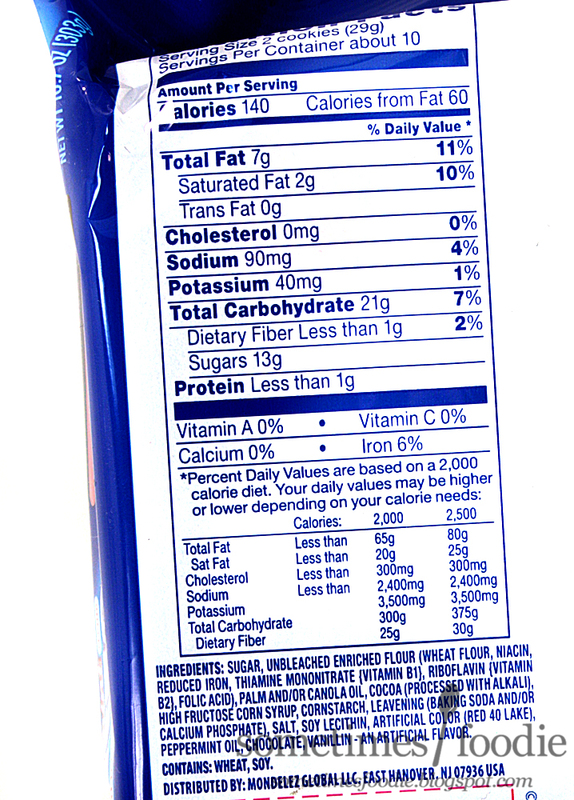 Is peppermint distinct enough from classic mint to warrant it's own flavor? I guess we'll find out! 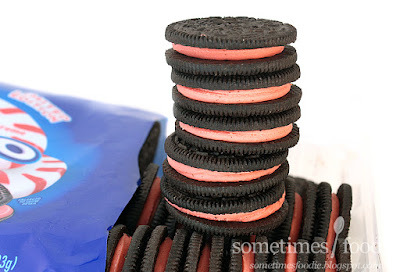 The Candy Cane Oreos had 2-colors of creme (white and red) split down the middle between the two chocolate cookies, and they were crunchy candy cane bits mixed into the filling to add a bit of texture and added flavor. 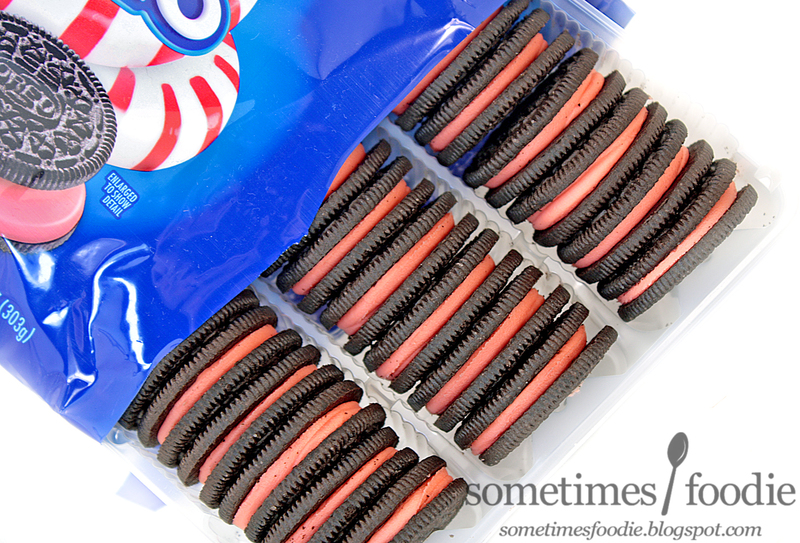 This Peppermint version has no fancy mix-ins or 2-toned creme filling. 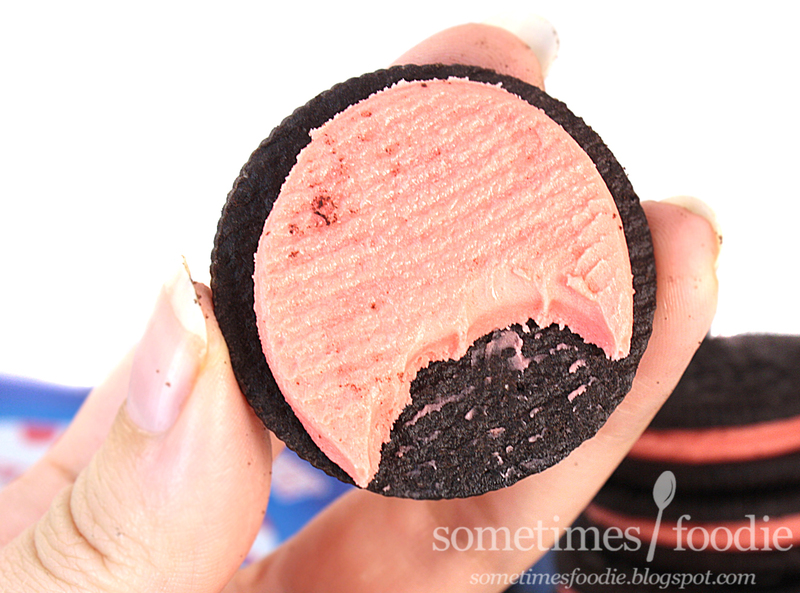 This time the filling is a pinkish red color, and that's all there is to it. 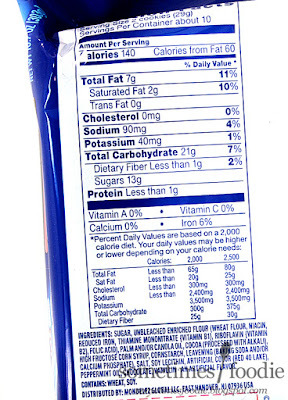 It's not bad, and the coloring doesn't effect the overall flavoring, but it's boring. 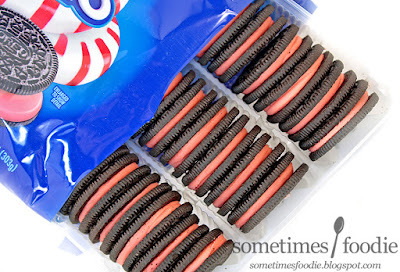 It's kind of funny, the Candy Cane Oreos were released so many years ago that Oreo hadn't gotten into their Limited Edition-groove yet. When comparing this packaging to the old packaging, this one looks a lot cleaner and more appealing, but the functionality and the product itself leave a lot to be desired. 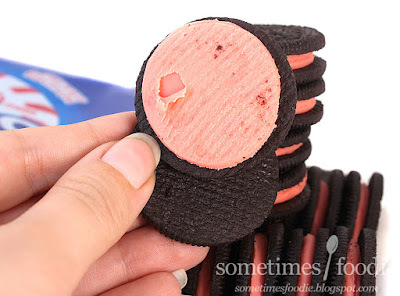 Now, I know I've made it a point to say how much I hated those peel-front style packages Oreo's been using, and I always preferred the twist-top roll-down bag that they used to have, but this bag...has neither! What is happening here? How to I reseal this package at all after it's opened? Do you expect me to eat all these in one sitting? Or awkwardly stuff this bag into another, resealable, plastic bag? I'll do it, but I won't like it. Is this punishment for all my peel-front package hating? Okay, so enough rambling about cookie-politics and packaging, let's get to the question at hand. Is this different from the classic mint Oreo? When I opened the package I was greeted with a fairly similar minty aroma to the classic mint Oreo, but this time around the minty-ness was more subdued and a bit sweeter. More like a vanilla'd mint than a straight up mint. Which smells a lot like the Candy Cane version that I discussed earlier. So was this seasonal flavor impressive enough to stand on it's own in a sea of minty cookies? I can't say it is. I personally found this cookies to be pretty yummy, but no where near as refreshing or addicting as it's minty predecessors. Unless you're someone who is SUPER into minty flavors and you want some slight variation in your mint sandwich cookie of choice, I'd say you can let this one pass you by. For a company that released so many interesting products in 2015, with so many awesome new flavors, this one feels unfinished from concept to execution.